The record that launched a thousand ships - or, indirectly, several hundred English dance bands - first appeared as a 99-copy white-label LP 'Record No 1' published by Reg Hall and Bob Davenport in September 1965. A number of these had to go to the participating musicians, archives, for review etc - so perhaps only 75 or so were actually sold. The issue was sold out in a fortnight, mainly to the audience at The Fox, Islington, where Reg and Bob hosted what might be termed the first 'revivalist' traditional music nights. Our copy was bought secondhand a few months later from an original purchaser who didn't think much of it. ... totally oblivious to the fact, even after Tony Engle had included a few previously unissued tracks on Boscastle Breakdown (1974) and re-issued English Country Music on Topic (1976), that a following for our record had been building up and it had become a model for a new generation of melodeon, concertina, fiddle, dulcimer, banjo and brass players all over England. Would that it had been so! The truth of the matter is that it proved a catalyst for a very small number of such people in the late-sixties and early-seventies, whose playing and recordings then proved the model for the rest of the of the late-seventies and eighties. Few of those who came after seem ever to have listened to the record - or, if they did, they were able to take very little from it. It's also certain that Reg is rather overstating the case - he, at least, must have been well aware of the developing interest in the music in the late sixties. I remember Chris Morley's East Suffolk Band receiving a warm reception at The Fox in 1967 and the influx of young players at Reg's Eagle sessions surrounding the Bampton Whit Monday morris tradition, at roughly the same period. Oak included three of Scan Tester's tunes on their 1971 LP Welcome to our Fair, of which he had a copy. The greatest surprise to me was that Walter's Untitled Polka had become a favourite with them. Mervyn and I had considered it so far removed from modern taste - even modern taste in traditional music - that we thought we were risking antagonising our potential supporters by including it on the record. He and Plunkett were only about a decade older than us, yet it's clear that they and we heard the music from completely different starting points. For practically everyone I knew, the Untitled Polka was the stand-out track ... the tune to learn first (sound clip). Indeed, for some of us it was the only tune to learn, since we already knew many of the others from family sing-songs or the radio. Its appeal, apart from being a great tune, was precisely that it was 'so far removed from modern taste'. We were, I think, unconsciously looking for ways to reclaim some sort of identity and cultural heritage in the face of the increasing Americanization of our world and the rising tide of badly-played Irish music among our contemporaries. And it was precisely because it wasn't one of the pop-song tunes of our parents' generation (who had left us a legacy of World wars, Holocaust, rationing, Austerity, the nuclear threat, sexual repression - the list seemed endless at the time) that caused it to appeal so strongly to us - to stand out from the sea of Red Wings and Jenny Linds. We picked on that tune particularly, for the same set of complicated reasons that we preferred (say) Fred Jordan to Martin Carthy, or - more apposite - Bampton to Headington. I'm very surprised that Reg - a thoughtful and perceptive man - didn't realise this. It is, of course, possible that we were not the 'potential supporters' that he and Mervyn were thinking about at the time - but that's rather deep waters to be getting into in a record review! 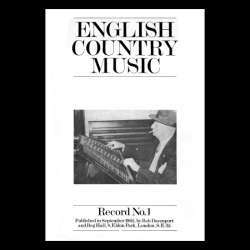 It's difficult to overstate the importance of Record No 1, or the influence of The Fox club, to the subsequent development of the English Country Music Revival in the 1970s. I don't mean to pretend that a bunch of us youngsters who bought the record and frequented The Fox immediately started to play this music, meet the traditional players, copy their style ... that would be far too linear and simplistic. But the fact that the music and the players were available to us provided a focus for the undefined yearnings for a music we could begin to call our own. Almost uniquely, at that time, it was something we could fight for - whereas our adult experience of the world prior to that had been defined by our fighting against things. In truth, few of us learned very much from Record No 1 at the time, but it did give us a starting point and a direction - which allowed some of us to go on to begin learning things in later years. Anyway, back to this present CD. 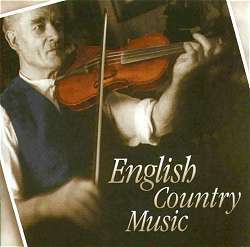 The 67½ minute third edition of English Country Music, contains a substantial number of extra tracks - 27 compared with the original 13. It also appears from the notes that a few tracks now feature different 'takes' from those originally presented. These were all recorded on the 4th and 5th of August 1962, so a glance at the track data reveals that three further recordings from those sessions have been added, together with some made by Plunkett and Hall in 1959/60 and one from 1966. The full track listing can be found in our Topic Discography. The new 32-page booklet contains an admirable explanation of how the recordings came to be made, together with the harrowing account of how so many of them came to be lost! There are also detailed and fascinating mini-biographies of the principal participants. It differs from the original - I don't have the Topic (second edition) to compare it with - in omitting the 'Music' and 'Recordings' sections of the notes. It is true that much of this information now appears dispersed through the main notes, but it does mean that if you want to find out something about a particular tune or track, you have to re-read the entire booklet until you come to the bit you're looking for. This seems to be the Topic way with booklet notes these days - starting from the Voice of the People series. Presumably there must be some rationale behind this approach but, as it has never been stated as far as I'm aware, the results are often irritating. The music is, of course, as delightful as it ever was - twice as delightful really, since there's almost twice as much of it on this CD and the cleaned-up sound, and format which doesn't rely on a Dansette for reproduction, makes for much easier listening. The additional tracks are quite as good as the original 13, and it's a real joy to get so much of Walter Bulwer's solo fiddle, often with Daisy on piano back-up, from back in 1959. I think my favourite is track 14, Shave the Donkey, where Reg takes the fiddle lead and Walter plays a second harmony part (sound clip) - just gorgeous! Unusually too, for a record of this kind, it's one which works in two ways. Attentive, uninterrupted listening pays dividends as always, but the music also works rather well as a background to chores, reading, meals, conversation - even quiet times at parties! I think this is because there's little of the 'performance' element involved - just some people sharing and enjoying each other's music ... and this allows you to share it too, without being confronted by it in any way. Not what I normally look for in a record of traditional performers, but a pleasant and unexpected bonus. Unreservedly recommended - even for those of you who have the LP version(s) ... when did you last play them anyway?